We use only the highest quality, slow-release granular fertilizer beginning with a pre-emergent weed control/fertilizer combination product applied early in the spring to achieve a quick “green up” and reduce the potential for weeds to develop. We follow up with well-timed fertilizer applications to maintain a lush, healthy lawn throughout the season. We practice Integrated Pest Control methods using liquid products to ensure your lawn is weed free while minimizing impact to the environment. We also offer free service calls to address stubborn broad-leaf weeds. Unlike many companies, we guarantee 100% coverage and you will see the results – especially around those detail areas around buildings where complaints often originate. Spring Application of a custom-blended, granular fertilizer with a pre-emergent weed preventative. This application shall occur only when ground temperature reaches 55-58° Fahrenheit. This is the optimal time for maximum effectiveness, and early spring green-up. 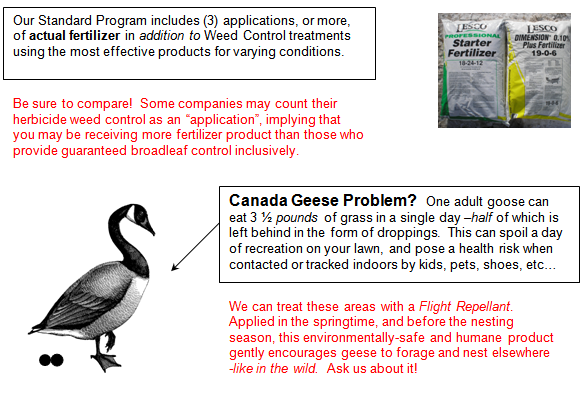 Broadleaf Weed Control. The property will be monitored throughout the summer months, beginning in late May/early June, and treated as needed with full coverage and/or spot-spraying. We offer free service calls to address stubborn broad-leaf weeds. Mid-Season Application of a custom-blended, 100% slow-release granular fertilizer to sustain a rich green color throughout the summer. Weed Control applied as necessary. Fall Application of a custom-blended, granular fertilizer/winterizer. We’ll monitor turf conditions for insect or disease problems and propose solutions based on current Integrated Pest Management practices used by the Minnesota Department of Agriculture. Treatments are available at an additional cost. * Our STANDARD PROGRAM includes (3) applications of fertilizer. Optional 4th and 5th applications are available for an extra lush and greener lawn. The 4th shall occur in late May/early June, with the Standard Mid-Season application to be done slightly later. The 5th application shall occur between the Standard Mid-Season and Fall applications. This contract includes 3 fertilizer applications, plus free broad-leaf weed control.